Taiwan’s east coast has always been the wonderful place for tourists from Europe, America, Japan, Korea and China to visit to, Taroko especially. The beautiful snow scene at Mt.Hehuan,the majestic sea of clouds at Guanyuan, the mysterious Shakadang Trail, the tall and flourish Sacred Tree and also the popular Jiuqudong(Tunnel of Nine Turns), Tianxiang and Qingshui Cliffs, all of them are the places where international tourists want to visit the most as soon as arriving in Taiwan. In 2014, Taroko National Park Headquarters Office specially made a 12 minutes long eco-tourism video for international tourists traveling at Taroko in a more interesting and different way, this video introduces you 18 extremely beautiful scenes in detail. This video focuses on natural, cultural and eco scenery, and it also includes the introductions of scenic spots around, offering convenient information for tourist to travel. In order to create more in depth traveling experiences and new aesthetic activities, Taroko National Park connects natures, arts, aesthetics and experiences, holding Taroko Gorge Music Festival and world-famous marathons every year. For promoting characteristic national park eco tour and environment education, Taroko National Park Headquarters Office specially organized “Taroko Tour” serial activities under the”2014 National Park Week New Leisure and Recreation Serial Activities” overall planned and managed by Construction and Planning Agency, Ministry of the Interior during June to September in 2014, including three one-day tours with local characteristics, “Truku Culture Experience Activity,” “Xibao LOHAS Experience Activity” and “Luoshao Village Experience Activity.” Therefore, the tourists get to walk into the local community, experience Taroko culture in person, and the harmonious life between human and land at the mountain. 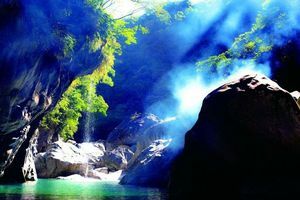 Taroko National Park Headquarters Office said those places at Taroko such as aboriginal tribes, Xibao and Luoshao villages along the Central Cross-Island Highway, they are all full of local characteristics and stories, and it is worthy for everyone to enjoy. Welcome to attend the activities and we look forward to your feedback. 2014 National Park Week New Leisure and Recreation Serial Activities, “Taroko Tour” serial activities have been opened to sign up as from today. “Truku Culture Experience Activity” is processed at 6/28, 7/12, 8/17, 9/6. “Xibao LOHAS Experience Activity” is processed at 6/29, 7/20, 8/24, 9/14. “Luoshao Village Experience Activity” is processed at 6/14, 7/19, 8/16, 9/13. For more information, please check the activity general regulation. These three activities are sponsored by Taroko National Park Headquarters Office, and cosponsored by Hualien County Central Cross-Island Leisure and Recreation Development Office, China Youth Corps Hualien Branch, Ketusan Studio, Nadolan Studio, Gelewenchuan Studio, Dageeli Tribe and Bodasan Culture Institute.